Are you an individual who is passionate about writing and who wants to join an encouraging and insightful community? If you answered yes, then the Creative Writing Club might just be the perfect club for you. On March 8, Cody Reed hosted the first meeting for the Creative Writing Club in the UCCS Writing Center in Columbine 316. As a third-year English literature major, Reed became the president of this club after he observed many students participate in a popular writing event known as Nanowrimo, National Novel Writing Month. Reed went on to explain that writing is typically a solitary act and through starting a club, writing can become more of a group activity which will create a strong writing-based community on campus. He also expressed that when many people think of creative writing, the majority of what comes to mind includes short stories, poetry and fiction. However, according to this new club, “Creative Writing is simply the act of creating something.” which includes all types of writing, even academic and nonfiction. At the start of the meeting, Reed first introduced himself and had all participants go around the table and talk about who they were and why they joined the club. Any student is capable of joining this club, and there were students with all different backgrounds who are studying a variety of different majors. Because anyone who has the desire to write creatively is able to join, there were many different responses to what each member is hoping to get out of the club. However, it was clear that all members were looking forward to writing, talking, discussing and constructively critiquing one another in a supportive and encouraging environment. Multiple members of the club explained that they were simply looking forward to being able to write more and were excited to share their ideas as well as hear the ideas of others within the group. The majority of participants in the meeting said that by the end of the semester, they were confident that they will be better writers as a result of being a part of this club. During the meeting, the future for the club was discussed. One of the major aspirations for the club’s future is to go on Creative Writing Retreats. They talked about renting a cabin for a weekend and spending a few days in the woods enjoying nature, time together as a community and getting all of their ideas out through writing. 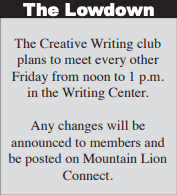 The members also mentioned attending multiple writing conventions, including The Gold Writers Conference in Golden, Colorado, as well as partnering with UCCS’s Collaborative Writing Club was also discussed. Reed is planning on organizing different workshops throughout the semester to help his fellow writers and hopes to be able to bring in some local authors to talk and give presentations to the club.